It goes without saying that the environment around ninjas was always so severe. Even if ninjas succeeded in their mission, it was meaningless if they could not make it back home. Ninjas were not permitted to even die. This was the rule of the community they belonged in and not for humane reasons. Ninja groups had to produce results under any situation in order to be hired again by their lords. For that reason, ninjas used a variety of techniques to survive. Let’s have a look at them. Ninjas worked in groups of two and occasionally three. The reason for this was for unexpected accidents that resulted in death. If a ninja suddenly got sick or in the worst case was killed in the mission then the others ninjas continued the mission. What was needed after such an occurrence was techniques to know the time, weather and directions which was called " Satten-Jutsu (察天術) " Having a solid grasp of such information was indispensable for ninjas. By what means was a ninja able to know the time when they had neither portable telephones nor watches in those days. Ninjas were able to tell the time by the direction of the sun in a day and through of the Great Bear constellation in the night. These methods were effective in any times as long as the ninja had experience. 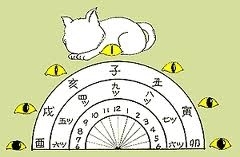 Secondly, ninjas used the eyes of cats in order to estimate the time. The pupils of cats change depending on the time. The blackness in them turns according to the time. Between 5:00 - 7:00 and 17:00 -19:00, the black parts are almost round. Around 7:00 - 9:00 and 19:00 - 21:00, they become round ovals. Similarly around 9:00 -11:00 and 21:00 - 23:00, they become sharp ovals like an almond. Finally around noon, their shape is almost as straight as as a needle. Ninjas made a poem describing this phenomenon in accordance with the timetable in those days which goes, " At 6, it is round, between 5 and 7, it is an egg, at 4 and 8, it is the fruit (seed) of a persimmon and at 9, it is a pin ". To grasp the exact time is the base of survival. The clock of a " Cat's Eye "
As ninjas had to live and survive hostile territories, it was a matter of course that they had to be familiar with the climate. Not only that, they had to forecast the weather to judge what day to storm and arson enemy’s castles. Naturally, windy days were useful for them because the fire would tend to burn well. On the other hand, rainy days were favorable when ninjas invaded hostile residences because in that case, the sound of rainfall erased the sound of their invasion. So how did ninjas forecast the weather? The quick way was to ask the local people like farmers, hunters, and fishermen. Japan is a country with four distinct seasons so the weather is very changeable. It is unthinkable today when Japan is an economic power but in the premodern times of Japan, people were masters of weather forecasts because their jobs were strongly influenced by the state of the weather. Such an ability was needed for their life and survival. Otherwise ninjas had their own specific rule of thumb about the weather. It was molded by their ancestral experience and observations and it was quite accurate. For instance, ninjas already knew about the foehn phenomenon 500 years ago. Besides that, a ninja's knowledge about weather forecasts is listed below. ・When a mountain seems near, the rain soon comes. ・When stars are glittering, it will rain the next day. ・If the webs of spiders are getting wet, it will be fine the following day. ・If a kite made a cooing sound in the morning, it would be rainy that day. If it was at night, the next day would be fine. If a kite soared in the shape of a circle, the next day would be fine. If a kite glided in the shape of a circle, the next day would be rainy. ・If cirrocumulus clouds were seen in the sky, the day would not be rainy, but it would be windy. ・On a cloudy day in the fall, it will not rain if there is no wind. ・A halo around the sun will invite the rain. In any survival situations, making sure of directions was a must and ninjas developed their own methods for this. First of all, ninjas referred to the position of the polar star and the Great Bear constellations at night. These methods were particularly useful because they could be seen in any season and helped them to survive. I already introduced the ninja's way of making an instant compass in the article " Needle ". Although a compass is very convenient, ninjas couldn’t always have them on them because in the checkpoints they may be spotted by censors. For this reason, ninjas immediately changed an ordinary tiny pin into an improvised compass. Also in addition to this, ninjas had other makeshift compasses they could make. 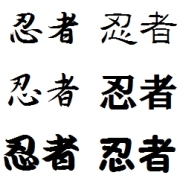 One of them was " Kisyaku (きしゃく). " Kisyaku was a thin iron plate, whose shape was like that of a ship and whose length was about 5 mm. Ninjas gave a magnetic force to Kisyaku by means of heating it like they did with the tiny needles. If ninjas floated Kisyaku on the water, the top of it pointed to the north. As a substitution to this, a wax painted pin also worked as an improvised compass too. As Japan is a mountainous country, and strongholds of ninjas were almost all located in deep mountains. Naturally, activities of ninjas were conducted on mountains mainly but Japanese mountains in pre-modern times were really dark at night and ninjas were very active at night because ninjas usually hoped to avoid the public eye as much as possible. So what did ninjas do to survive if they got lost on their mission? They couldn’t ask someone the way because there were no people around them. Then first of all, ninjas climbed up the ridge of the mountain. From there, ninjas looked around the environment to grasp a perspective of their position. As they went ahead along the ridge, naturally they could reach the path anywhere. It may seem a little dangerous walking on a ridge because of strong winds but it was much safer than advancing up the slope because then there was a possibility of falling down the valley. The essence of a ninja's survival was to choose the option which had the least amount of danger as possible exists. They never took a risk except for ultimate emergencies. To survive, ninjas were rational and scientific like special force units today.